In the monsoon of 1992 I was a volunteer at the Modern Annapurna High School in Siklis. 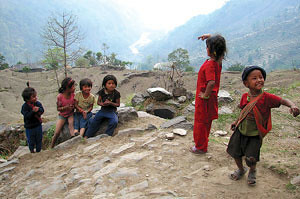 I was young, enthusiastic, and eager to learn about life in rural Nepal. It was a time of much optimism in Nepal, village elections had just taken place and ACAP (Annapurna Conservation Area Project) was moving into its second phase. I was able to see first hand the work being done by a small team of committed conservationists, who were motivated to environmental preservation, while ensuring that conservation did not impact the local communities with whom they worked negatively. The late Chandra Prasad Gurung headed ACAP then, an eco-tourism project that he himself had pioneered. The ‘boy from Siklis’ had the charisma and vision to change conservation thinking not only in Nepal but on a global scale. ACAP teams motivated community activities and development of a ground-breaking environmental curriculum for schools. Many hours were spent meeting, talking with and listening to local people, explaining the ACAP approach and how it differed from the then dominant National Park policy and approach to conservation. This was when conservation initiatives globally were based on the western perspective that the environment should be preserved whatever the cost, and that people were the problem. Thankfully, voices from non-Western, indigenous communities emerged to challenge this view and a more holistic model of development emerged that integrated conservation and development needs. Nepal was at the forefront of this paradigm shift and made a significant contribution to the legacy of bottom-up, people-centred development. Conservation leaders such as Chandra and the late Mingma Norbu Sherpa contributed to this shift. As a lecturer in the mid 1990’s at Liverpool John Moores University I returned to Nepal for research in the Annapurnas. At first, I questioned the sustainability of ACAP and its ability to meet the needs of all the people in the area, while conserving the environment at the same time. The relevance of the non-formal education program was also in doubt. But discussions with local people, especially women, proved how empowering and relevant ACAP’s literacy classes were. I helped facilitate the introduction of the REFLECT program into the Siklis sector of ACAP, an approach to non-formal education pioneered by Action Aid and adopted by Education Networks in Nepal, and was used it as the central research topic of my PhD thesis. Many people still ask “What has ACAP done? It only planted trees.” It is true ACAP supported local communities in establishing community plantation sites, but that was only part of the story. ACAP also backed local demand for development projects for over 25 years. In addition to the trees, there are now locally-run conservation committees, lodge management committees, and a range of other locally based institutions which have helped to establish power and control of resources at the grassroots level where it is most relevant and effective. It is hard to imagine what the area would have been like if ACAP had not existed. ACAP originally had a 20 year vision and in July 2012 the Nepal Trust for Nature Conservation (NTNC) was given one more year to manage the project. This could be seen as a wise move because after all the key mission of ACAP is to hand over resources to the locals. However, it has to be done responsibly and free from party politics that has plagued other conservation success stories in Nepal. ACAP needs to be transferred to local communities in a phased-out manner in order to build on, rather than diminish, its achievements. A new agency is not needed to fulfil this role, the staff within ACAP have the knowledge, skills, and connections to manage this process, but they need to be given the time to do it in a professional and supportive manner. There may in fact be a need for a pared-down version of ACAP to remain in place, to ensure that funds and projects are delivered in the area for the long-term. But it is time now for the project hand over. This was the original vision and it needs to be honoured, the question is how to do this. Funds from tourism and external agencies with an interest in supporting conservation and development projects will still be needed in the area as new challenges emerge, such as road construction impacting on tourism routes and climate change impacting on agricultural production. Rather than make a rash decision more time should be given to NTNC and the staff at ACAP to ensure the transition and handover are managed in such a way that local communities have the necessary support and skills to take full responsibility for the conservation of resources of the Annapurnas. There is still a need for ACAP to act as a go-between, but one that plays a smaller role in the process and is led more by the demands of local people rather than the wider political situation in which it finds itself. Sara Parker is a Senior Lecturer in the School of Humanities and Social Sciences at Liverpool John Moores University whose PhD focused on action research, non-formal education and women’s participation and empowerment.